You Otter Know, It's Sea Otter Awareness Week! Happy Sea Otter Awareness Week! If you live in California, check out the events happening near you. Everyone else, get ready for some otter science this week. Also I'm really sorry for that terrible pun. Otterly sorry. For now, marvel at the photogenic majesty of these sea weasels. Above: Sea Otter in Morro Bay, Andrew Reding/Flickr. When sea otters aggregate, they're appropriately called a raft. This diving otter might be looking for an urchin to eat. 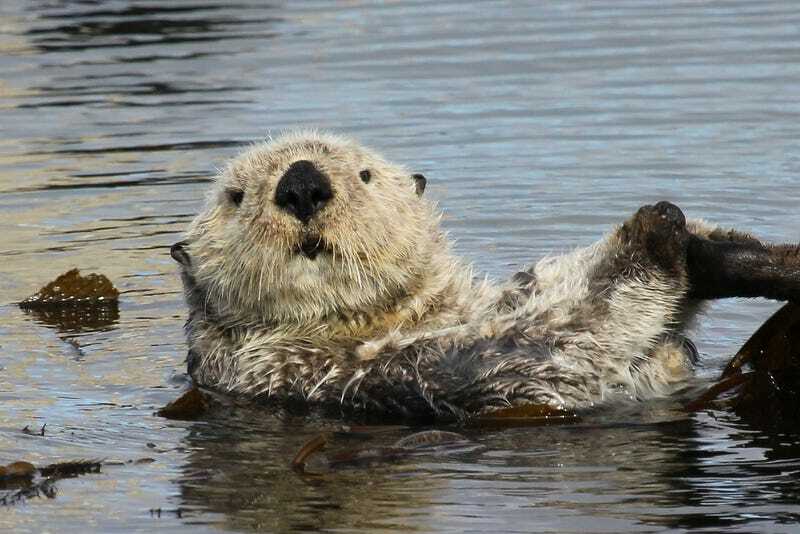 Sea otters sometimes wrap themselves in kelp to avoid floating away while they sleep. Photo by Chuq von Rospach/Flickr. When sea otters mate, the males hold onto the females by biting down on their noses. If you see a female with a red nose, you can bet she's recently mated. And check out those teeth! You don't often see them on land, but when you do, they're not the graceful critters they seem while in the water. But their membership in the group of animals including weasels and ferrets sure makes a lot more sense when you see them hobbling around on land. After they're born, the pups stick around mom until they're strong enough to survive on their own. They can often be seen resting on mom's belly while she floats. Here, this pup - almost as big as its mom is - is probably only days away from being completely weaned. Photo by Chuq von Rospich/Flickr.